I must have inherited my love for cooking and entertaining from my Grandmother Pat. I love bringing friends together over food. 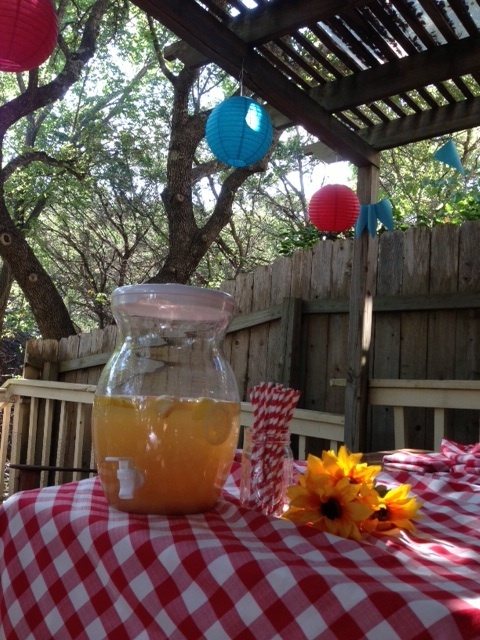 I recently threw a southern picnic party and I had to share some of my favorite recipes that I tried for the first time. Enjoy! The flavors are so good in this. This is not your mama’s coleslaw! In a medium bowl, whisk together yogurt, vinegar, pineapple juice, brown sugar, salt and pepper.Add the cabbage, green onions, cilantro, pineapple and jalapeno. Toss to coat well and serve immediately. The almond crumble adds an extra crunch! So good! I used fresh peaches. For the Pie: Place peach slices in a large bowl and sprinkle with 2 tablespoons of sugar. Gently stir until peaches are evenly coated and let sit for 10-15 minutes. Drain any juices that have collected and toss peach slices with lemon juice. In a large mixing bowl, combine the remaining ⅔ cup sugar, flour, and cinnamon. Add peach slices and stir until evenly coated in the sugar mixture. Heat oven to 400ºF. Line a pie pan with the refrigerated pie crust and flute edges, if desired. Spoon peaches into the pastry-lined pie pan and add the crumble topping over the peaches. (see crumble instructions below) Loosely tent pie with foil and bake on the middle oven rack for 45 minutes, removing the foil for the last 15 minutes. Cool pie on a wire rack at least 2 hours before serving. For the Crumble: Add flour and salt to a food processor and pulse until combined. Add brown sugar, butter, and almonds and process again until well combined. Sprinkle almond crumble over the peaches before baking. – You can use fresh OR frozen peaches in this recipe. If using fresh, you’ll need about 6-8 medium peaches, peeled and sliced. If using frozen, thaw the peaches completely and drain any liquid before using. I prefer to use frozen for convenience purposes, but fresh peaches in season taste the best! – Letting the peaches sit coated in sugar for 10-15 minutes draws the juices out of the fruit, which is called maceration. By draining that excess liquid before baking the peaches into a pie, you’ll have a fruit filling that is thick and syrupy, not thin and watery. I loved your lemonade too! Could you give the cocktail recipe for that? Oh my word!! I actually have a comment! 🙂 Thank you! I’ll get that to you.